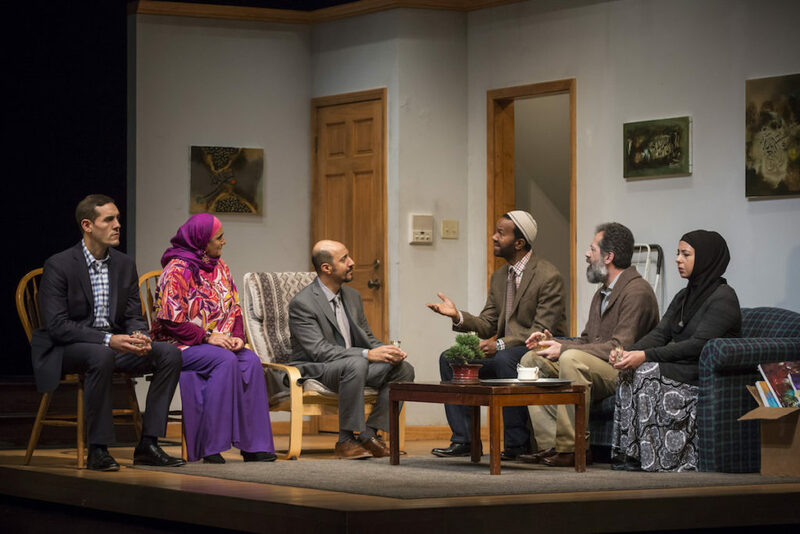 Basic Storyline: Following the wake of an emotionally taxing divorce, we are introduced to Sam (Michael Perez), a 30-year-old Muslim man who seems to be shameful of his heritage. Holding marriage as such a high criterion, his parents (Armo Salama and Laura Crotte) look to match him up with an Iraqi refugee (Susaan Jamshidi) who is prideful of hers. Reluctantly, a romantic connection begins to blossom as they sift through each other’s emotional baggage and teach each other how to heal from their past wounds. Yasmina’s Necklace is speckled with honest, family moments while having the ability to tackle serious themes such as racism, culture identity and prejudice. What stood out: From start to finish, the whole play is well-paced, emotionally engaging and well acted. It’s difficult to pick standout performances from such a talented ensemble, but I could not help but feel elated every time Laura Crotte (Sara) or Rom Barkhordar (Musa) were on stage. Both played the respective parents of the two leads. While adding levity to each scene, each of their characters were both deeply fleshed out and grounded. 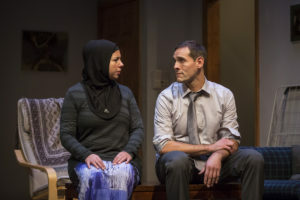 The strength of their performances helped add color and context to the depth of their characters, all while shining a light on the culture of the Muslim religion to allow Jamshidi (Yasmina) and Perez (Sam) to embellish in incredibly honest, effective moments that create the pillars for which the show stands. I always love seeing Goodman shows because I know, if anything, I will love just looking at the set. This was no exception. The basic layout is simple in design, but it displays character on its own with the stage being split down the middle, with a more lavish dining room on the left side of the stage and a more economic apartment living room on the right. What I loved most, however, was a large arching row of windows of Arabic design hanging above both households, which stayed illuminated during the whole show. I thought it was a beautiful piece of physical storytelling, holding the theme of their culture above them at all times, tying into areas of conflict for individual characters. Final Thoughts: Yasmina’s Necklace is speckled with honest, family moments while having the ability to tackle serious themes such as racism, culture identity and prejudice. It is both entertaining and informative, and a nice reminder that at the end of the day, we are all the same people. A much needed reminder in this day and age.